Each player uses one color set of rollers in the first round of play, blue goes first. Standing behind the red goal the blue player rolls one rollor at a time to the other goal. The rollor should be rolled on the edge, with a wind-up and release as in bowling. The rollor must touch the ground with in 4 feel of the release. Once the blue player has played the red player takes a turn. Throwing the rollor is NOT allowed. Throwing the rollor like a Frisbee is NOT allowed. Only one player scores each round and that is the player with the rollor that is closest to the goal. The measuring cord should assist in determining which player is closest. In the case of a tie neither player scores. All rollers of the closest scoring color to the goal receive points. 1.) Rollors that land on their side - score a point value equal to the number that is showing. 2.) Rollers that stop on the edge - score a point value equal to the sum of both sides. 3.) Rollers that come to rest against the goal - score a point value of double the number showing. Play continues with rounds that are started by the last color that has scored, rolling back and forth between goals. To win, a player must achieve a total of 21 points or more, and must have two more points than the opponent. Each team, consisting of two players each, uses one set of rollers. One member of each team is positioned at each goal and rolls to the other. Turns are taken in the same manner as in horseshoes. Playing and scoring is the same as in 2 player basic game. 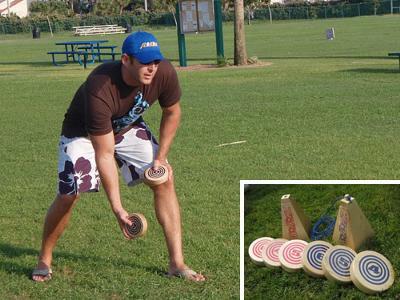 Each team consisting of three players each uses one set of rollors. Play is the same as in the two player game, except that each member of a team rolls one rollor per turn. Scoring is the same as the two player basic game. 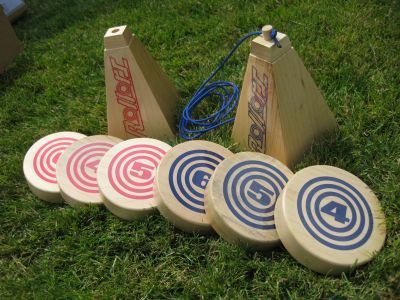 A children's version can be played the same as the beginner's games except goals would be set up 15 to 20 feet apart and ALL rollors landing within a five foot radius would score. Each team, consisting of two players each, uses one set of rollers. One member of each team is positioned at each goal and rolls to the other. Turns are taken in the same manner as the horse shoe throwing. Playing and scoring is the same as in 2 player basic game.